Although wooden houses are still being built, many of them were built decades ago. Not surprisingly, during the long period of operation, the bearing functions of the old base have deteriorated. To strengthen them, it is necessary to repair the foundation of a wooden house. 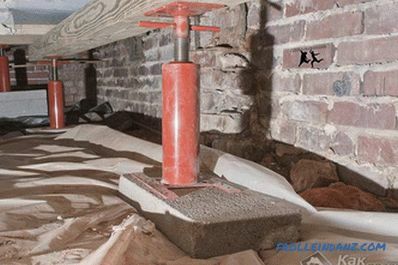 Before starting a wooden house foundation repair works, first the walls should be raised to a certain height. Wooden structures are easily amenable to such manipulations, so there should be no problems with the operation. Before you raise the house you need to perform preliminary work. A wooden house needs to be raised rather slowly, because if you rush to raise it, the integrity of the walls will be endangered. First you need to remove all items from the house life and especially those that rely on the floor. 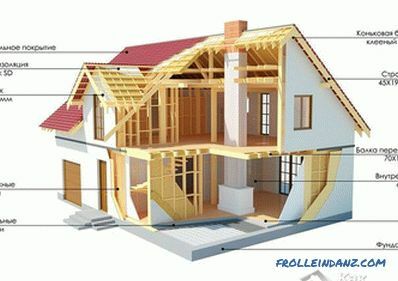 In addition, you need to dismantle the doors and windows with frames, as well as disconnect all pipes and electricity. All buildings, which are close to the house, must also be dismantled. 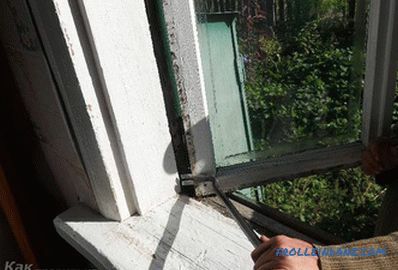 Dismantling the window in a wooden house Then you need to get rid of trees and bushes that grow next to the house - no more than 1.5 m from the walls. In the middle of the building, all floors must be dismantled. When completed all the preliminary work, you can begin to raise the house with the help of jacks. The jacks are inserted under the walls from different sides of the house at the place of transfer of the logs, and the two installations must be located symmetrically between them. Units when lifting can enter the body logs. To prevent this from happening, metal plates with a thickness of 5 mm or more should be placed under the wood. So that the jacks do not sink into the ground, under them are placed boards. 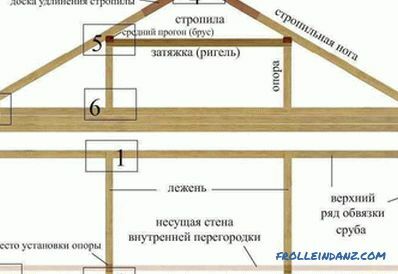 In this way, jacks need to raise the house on one side by about 5 cm. To fix the rise of the wall, you need to slip under the logs reliable bars. After that, the lifting mechanisms are in the same way substituted on the opposite side of the house, and another wall is lifted to the same distance. Fixation occurs with the help of all the same bars. In this unhurried way, you can first slightly raise the whole house. 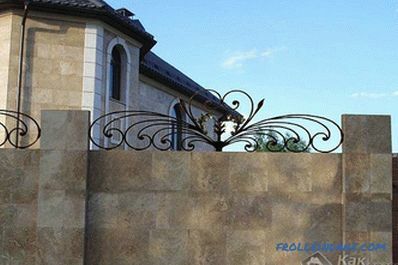 No need to hurry with raising the house to a large height, as this may result in the displacement of structural elements and violation of relaying. 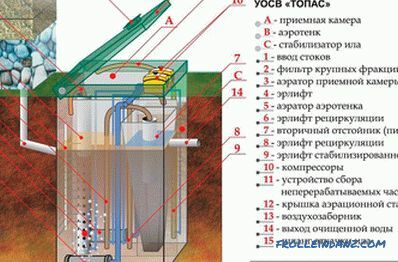 In order to fully replace the basement of a wooden house, you need to raise the object by at least 0.5 m. This will allow you to fill in the top of the new base, if you consider that in many cases the old foundation goes deep into the ground. Following the rise of the building to a height that will allow you to freely perform the necessary work, you need to fix the house. Concrete blocks that are able to withstand heavy loads can cope with this function. To prevent the blocks from biting into the ground, it is recommended to lay wide boards under them. The house is raised - you can repair the foundation. If you restore the servant many years of tape foundation, he will be able to securely hold a wooden house for more than one decade. 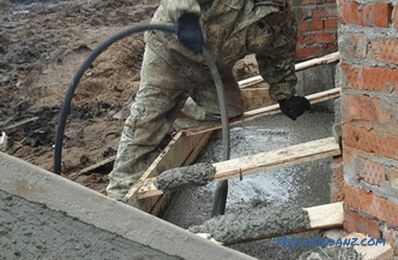 To reinforce the former foundation, reinforcement should be applied and an additional reinforced concrete bundle along the base of the foundation should be made both from the outside and from the inside. In addition, in order for the repaired foundation to be stable and durable, it is necessary to raise the foundation above the previous mark. Before starting repair work, stock up with the necessary tools and materials. At the initial stage of work along the old foundation, a trench is dug from the inside and the outside, the depth of which should reach the bottom. After creating access to the concrete structure, the foundation is carefully cleaned of adhering soil. 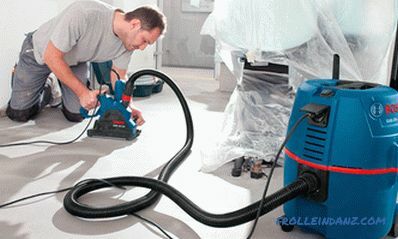 If waterproofing is present, it is removed. In concrete, most likely, there will be cracks. They need to expand and remove pieces of concrete that loosely adhere. Reinforcement After thorough cleaning of the foundation, an additional reinforcement grid must be constructed. 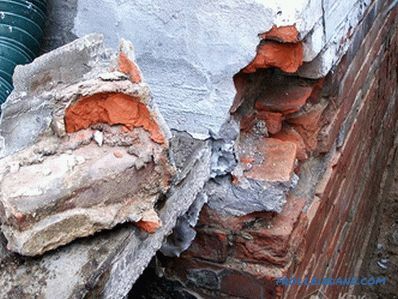 If the reinforcement mesh was incorrectly made or the pipes were used for this purpose, a new binding must be done. For this work fit fittings with a diameter of 12 mm. 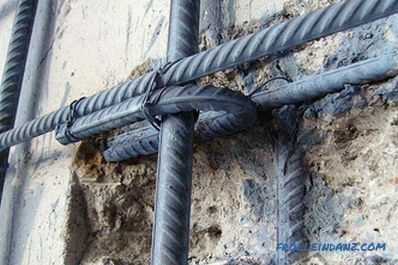 For greater strength of the steel frame, it is better not to tie the reinforcing rods with wire, but to weld them together. This is due to the fact that the structure of the frame will include not only segments that will penetrate the concrete and pass along the foundation, but also the grid. It will cover the base, and enter the base structure at a certain height above the ground. To create a reinforcing mesh in the old foundation, holes are made using a perforator, which should be perpendicular to the base. Holes are made both from the bottom and from the top, with the step between them should be about 0.5 m.
Then the grinder cuts the reinforcement segments. They are inserted into the holes made perpendicular to the walls of the foundation, while the pins should protrude 15 cm beyond the base. After all the segments have taken their place, they are welded to the bars of the reinforcement wooden house. Having made a horizontal metal frame, it is the turn of its pull up. 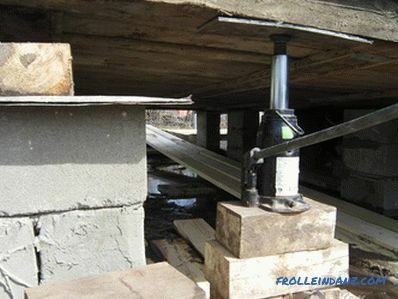 After this, the foundation for a wooden house can only be poured with concrete. After completion of work to reinforce the reinforcement of the old foundation comes the turn of concreting the frame. For this purpose, formwork is constructed both from the outer and from the inner side of the base - the boards are nailed together with a hammer. The pipes through which the communications will pass must be laid across the formwork. At the place of installation of the jacks you need to leave free space so that the jacks can be removed and put the house on a renovated foundation. 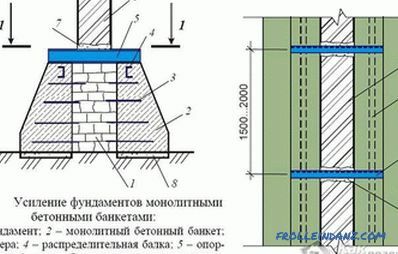 The walls of wooden formwork should be securely supported with improvised supports to avoid the destruction of the wooden structure under the pressure of concrete. Then the surface of the old base is wetted with cement mortar and concrete is poured. Lowering the house with the help of jacks is carried out when the concrete of the reinforced foundation hardens completely.